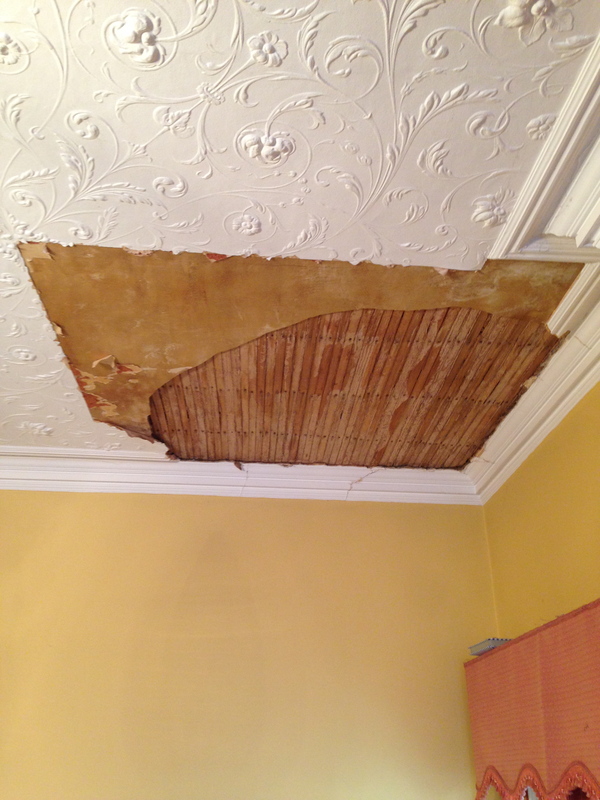 I’ve previously restored another Cameoid ceiling at this property in Northamptonshire, in the hallway – my customers were so pleased with the result that they asked me back to restore a water damaged section of ceiling in their Drawing Room. Unfortunately, a leak in a bathroom above caused the plastered ceiling below to fail creating quite a surprise on the floor for my customers. 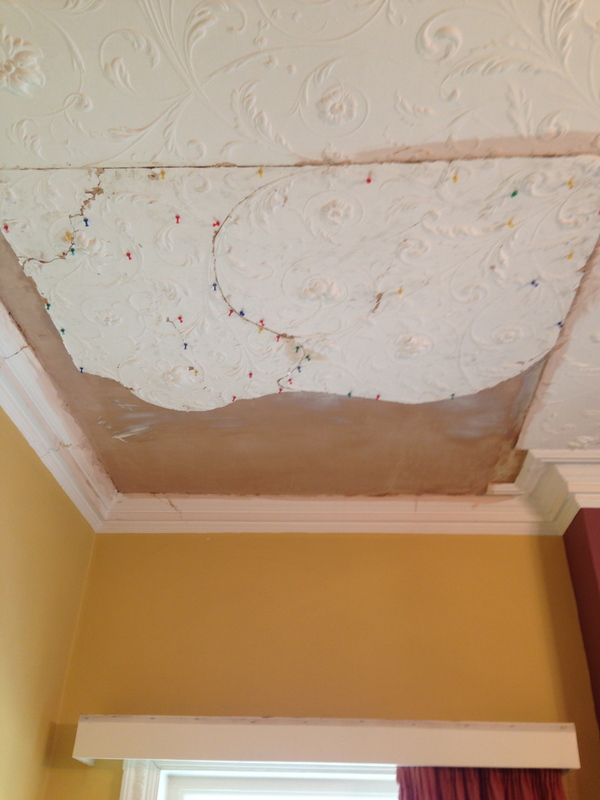 Following my initial survey, a plasterer reinstated the plaster work to the affected area… and did a great job. The section of damaged Cameoid would be too large to handle in one piece – the approach that I took was to cut it into more manageable slices. With Cameoid I always cut along a pattern as I find that it is more straightforward to fill at a later stage. 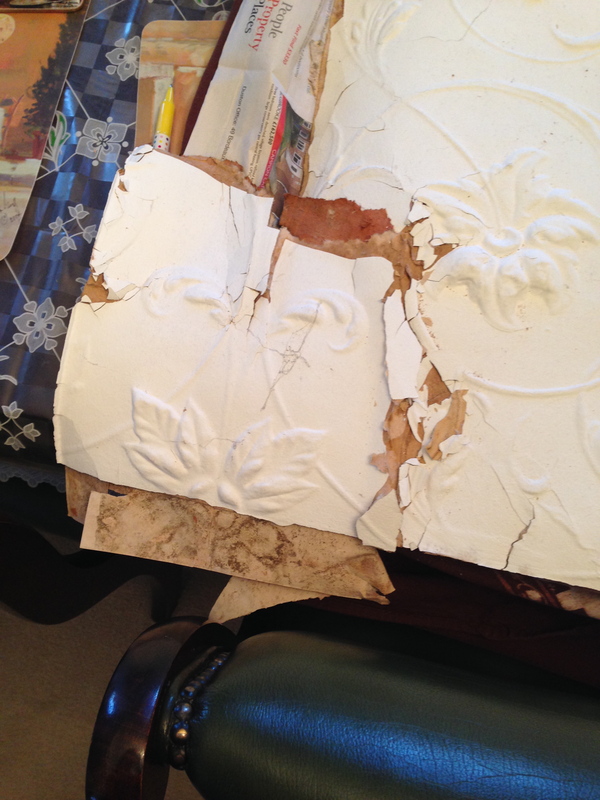 Once the new plaster was sealed, I started to reinstate the Cameoid jigsaw puzzle. Below you can see a few sections in pinned into place. I used Lincrusta glue to adhere it, in this instance. Once all of the Cameoid was back into it’s rightful position on the ceiling, I started on the arduous task of filling. I used a number of fillers to complete the task, finished off with my go-to filler; *Prestonett Lightweight Filler. I left the job ready for my customers coving specialist to replace the damaged sections of coving and their Painter & Decorator to apply a couple of coats of Emulsion. 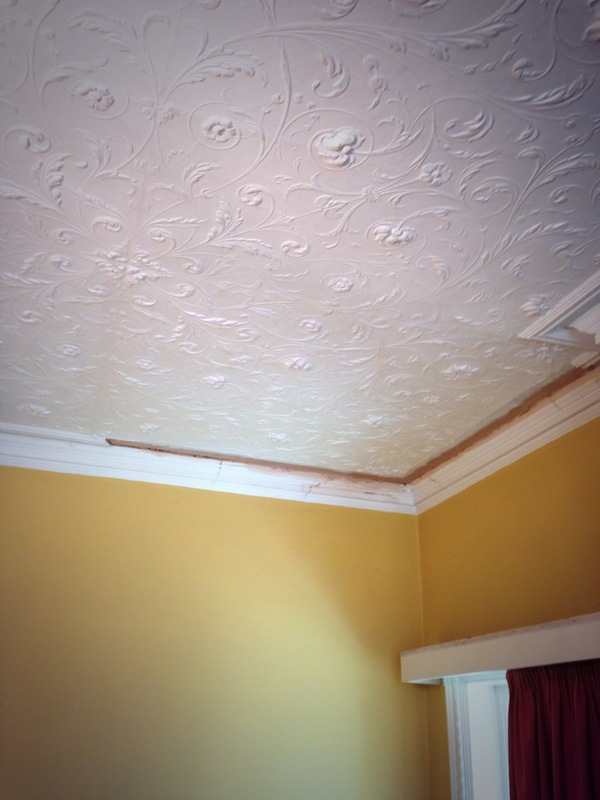 This entry was posted in Uncategorized and tagged Cameoid, Ceiling Restoration, Lincrusta, Lincrusta Specialist, Northhamptonshire, Prestonett, Restoration, Traditional Painter, West Midlands, Zinnser on June 20, 2014 by mjguestltdblog.